Today’s #BEDN prompt made me ponder a while. I could have written about new friends I’d made perhaps, or my two babies, but I thought I’d stick to a traditional ‘making’ post. Sadly, my craft skills are currently limited to making loo roll animals with my kids. We may well make loo roll Christmas decorations this year too! Why change a winning formula? I do like to try attempting new crafts though, and will give most things a try. One thing I’m not too bad at is baking. And with our month without supermarkets, I’ve decided to try and make the things that I’d usually buy. Starting with biscuits. Quite often, I make shortbread biscuits for the kids and they always prove really popular. Given that they won’t be having supermarket-bought biscuits this month, I thought I’d start the month as I mean to go on and make some biscuits with them. It has to be said that making biscuits for my kids is far easier than making biscuits with them! Armed with the basic shortbread recipe (outlined below) that I’ve known since my own childhood, we set about making donkey shaped biscuits to have as a treat with a glass of milk. When I’m making these biscuits alone, it’s really straightforward, but the kids got a bit carried away with the mixing and so the texture was rather interesting, as you can see from the photo! Sadly, the first tray, at the top of the oven, ended up rather too donkey- coloured. By which I mean blackened. Thankfully, I kept a better check on the second batch and they turned out an appropriately biscuit colour. And then, once the kids were distracted elsewhere, I made more shortbread squares, which had a more ‘shortbread’ texture having not been over-handled by over-enthusiastic helpers! See? Weird texture. This is what comes of baking with my kids! The month without supermarkets will be lots of fun if we replace shop-bought treats with home-made ones. It’s nice to know that these biscuits only contain butter, flour and sugar. No unsustainable palm oil. No other unpronounceable additives or preservatives. I will continue to experiment with other, more exciting baking, but as a standby, these are unbeatable. 6oz plain flour, 4oz unsalted butter (which needs to be at room temperature), 2oz caster sugar. Cream together the sugar and butter and then add the flour slowly until it all comes together in a dough-like texture. It will be crumbly and a bit tricky to keep together, so roll it out (onto a surface lightly dusted with more caster sugar if it needs it to prevent sticking) and then cut into fingers, squares, donkey shapes or using any other fun cutter you can find. Bake at Gas mark 2, (150 C) for 25 – 30 minutes. Don’t leave them too long, like I did! As an aside, I quite fancy creating a giant collection of interesting shaped biscuit cutters, so if you know where I can find some, do let me know! It’s been a great good first few days, I’ve definitely spent a bit more money but I’m wasting less food too. We’ll see how I get on! Hello, it doesn’t matter if the texture is a bit off, I bet the little ones will enjoy then anyway. I love shortbread, had planned to make some today but failed to fit it in. Tomorrow maybe. OH MY GOD! They are bloody gorgeous. I love them so much. I did my face as a Mexican sugar skull last Hallowe’en. Let me know when you’ve used them, I’d love to see photos. I bought them in a bit of a frenzy – now I’m thinking ‘Do I actually have the skills to make them look anywhere near funky enough?’. I was about to suggest Peter Maturi as well. Not tried TK Maxx for baking stuff though, will have to go check that out. ta! TK Maxx is good for everything! But I adore Peter Maturi. I’m going to treat myself to something from Peter Maturi I think – I do love TKMaxx, but not sure where it fits in with my supermarket ban? 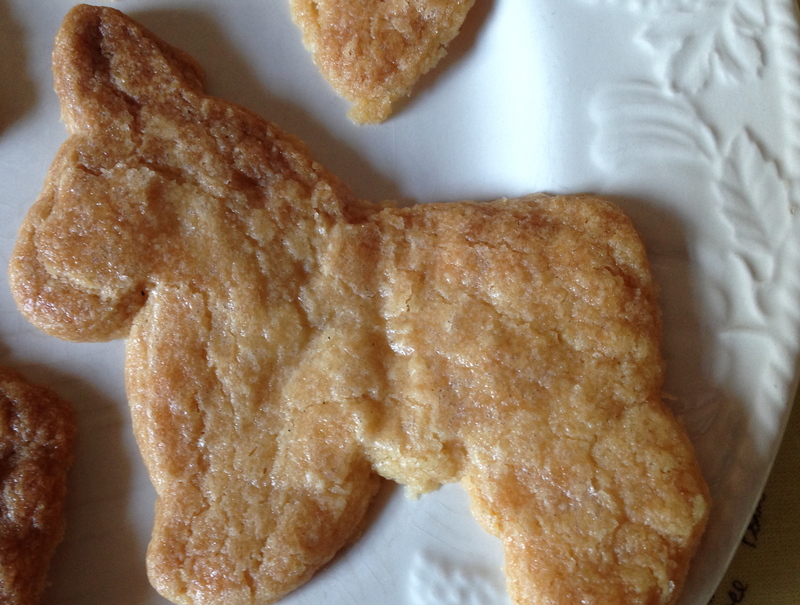 Donkey shaped shortbread. Now that is something I’ve haven’t seen before – but is the perfect shape for Christmas cookies. Very cute! They would make great, unusual Christmas cookies, wouldn’t they? When you start using supermarkets etc again look in Pound shops and TKMax. Lakeland are more expensive but have them.